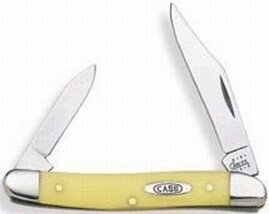 The Case Pen Knife with yellow delrin handle still has the same functional blades as the original model, but does update the knife with high carbon stainless steel and synthetic delrin handle slabs with the look of aged ivory. Nickel silver bolsters house the pivots of both knife blades, and the package folds neatly into a slim 3-3/8-inch handle that's barely noticeable in the pants pocket. The larger clip point blade serves for most ordinary chores, but the shorter pen blade with its stronger spear-point tip works better when you need some extra leverage. This particular blade was good enough that it outlived its original purpose, which was to sharpen the ends of quill pens in the days when people communicated by ink and paper. The short, straight cutting edge shaved a flat diagonal section across the tip of the turkey feather's quill. Today, it's equally good for any cutting job where precision counts. This traditional pen knife uses slip joint construction, holding both blades closed with steel tension bars. Catching the thumb notch of a blade pulls the knife open, and the same spring bar holds the blade in open position. Press against the back of the blade, and the knife folds with a snap. Another good choice for the dress pants pocket is the shorter but wider styling of the Case Baby Butterbean.